I’m a nut about preparation when it comes to speaking in public. When I was the managing editor of a newspaper, I did it frequently — quizzing candidates at political forums and emceeing the paper’s yearly awards event. Then there are the Q&A’s I’ve done in Taos with visiting authors and writers-in-residence. I do my research and plan my questions. Then I print them on paper in a large font, say 22 or 24. And I practice. I’m doing two readings for SOMOS on Thursday, June 30. 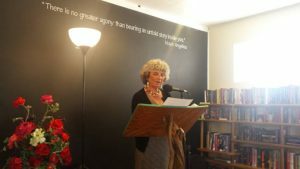 The lit group of Taos is celebrating its new headquarters aka salon with a marathon reading of about 50 authors from 10 a.m. to 9 p.m. The evening will end with noted author John Nichols. In the morning, Teresa Dovalpage, my collaborator and translator, and I will read from the first book in our los Primos bilingual series — the one about the magic fish. We’ve done a few of these. Teresa will bring her large, stuffed dog and I have posters of the illustrations my son Ezra did of the cousins (los primos) and their grandfather (abuelo). I return in the evening for the adult fiction portion of the event. 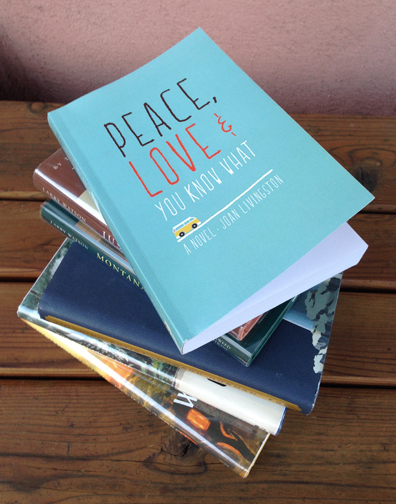 I will read from Peace, Love, and You Know What. Each author will have the floor for 10 minutes. So what to read? My novel moves awfully fast and a lot happens. So I chose a short chapter, called The Hard Truth. The three-day bash hasn’t started. The characters have pulled three all-nighters in a row for finals. One of them is a few credits shy but is figuring a way to fake his graduation so he doesn’t disappoint his mother. We meet Lenora. There’s lots of dialogue and humor. I’ve practiced a few times this week, using the timer on my phone. It’s well under 10 minutes. I think it will work. David’s show is called “You Kids Get Off My Lawn.” There’s some irony there since there is no lawn at KNCE. The station, located inside an Airstream, is surrounded by sagebrush and located next to a brewery. This time the shoe will be on the other foot, as my mother used to say. I have no idea what David will ask me and that’s just fine. 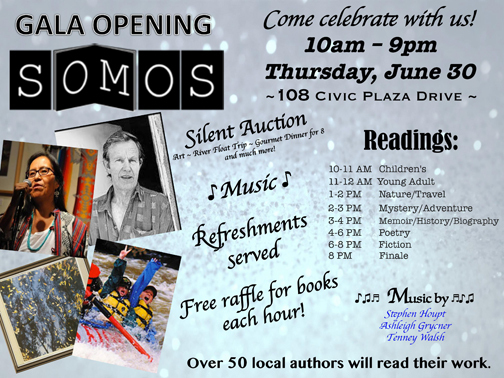 PHOTO ABOVE: That’s the poster for the SOMOS open house June 30. I was charmed when I passed the SOMOS office in Taos yesterday to see a poster on the window promoting my July 8 reading. I am going to read from Peace, Love, and You Know What, answer questions posed by my friend, Teresa, and hopefully sell some books. I told Teresa I don’t want to know the questions ahead of time. That would take the fun — and a little bit of the fright — out of it. This is a big switch for me. I’m the one who usually asks the questions, and I will be doing it again Wednesday, June 22, with Priscilla Solis Ybarra. Priscilla is the first of this year’s Aldo and Estella Leopold Foundation’s “Mi Casita” writers in residence. She is staying for a month at the cabin where Aldo Leopold, one of the great voices for the environment, and his wife, Estella Luna Otero Bergere Leopold, stayed when he worked for the Carson National Forest. The home, their first, is located in Tres Piedras outside Taos. Interestingly Priscilla’s research focuses on Estella and her impact on the writings of her husband, notably A Sand County Almanac. Her goal is to write a biographical portrait. Priscilla is an assistant professor in the Department of English at the University of North Texas, specializing in Chicana/o literature and theory as well as environmental literature and ecocriticism. She recently released a book, Writing the Goodlife: Mexican American Literature and the Environment. As a member of the committee that selected this year’s writers in residence, Priscilla’s proposal was an easy choice. Certainly I have to believe Estella was more than just “the missus” and that she was a major influence on her husband’s work. Their five children chose careers as environmental scientists and activists. To prepare for the Q&A, I am reading Priscilla’s book — I am about three-quarters of the way through. I have other material. I will come up with my list, and I am certain we will open it up to questions from the audience. From my years as a journalist, I know better than to ask yes or no questions because you will get yes or no answers. There are times when that may be necessary when you want to put somebody on the spot, but I believe open-ended questions are the way to go. My aim is to advance the conversation. I confess I love doing these Q&A’s. During the past few years, I have done them at various venues with such authors as Valerie Plame (twice), Anne Hillerman, and the former fugitive Katharine Anne Powers. I also interviewed last year’s Mi Casita fellows. I met Priscilla at a musical event this week. I assured her it would be a fun experience. From what I’ve learned so far, I believe those who come to the program will enjoy listening to what she has to stay. Here is the info: Wednesday, June 22, 6:30-8:30 p.m. at the Harwood Museum of Art. And it’s free. ABOUT THE PHOTO ABOVE: A little levity, at least for me, at the Taos Farmers Market. 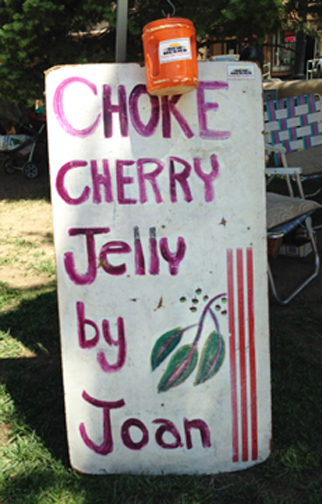 No, I am not the Joan who makes choke cherry jelly. I am going to have to buy a jar one day. There’s nothing like a book in hand. That’s the way I felt when I got the proof of Peace, Love, and You Know What in the mail. Now it’s your turn. The novel’s out in paperback. Just now. Yes, I am big into digital. When I was a newspaper editor, I worked on the computer for many hours. I write my fiction that way. I keep up with friends and the news online. I even own a Kindle. But after all that screen action, I like looking at ink on paper. I like touching it. I’m not alone. I have heard from people asking when they can buy the paperback version. I hope you feel the same way, too. I’m keeping the price at $11.95, which is not a large profit margin for me, but I want people to buy the book and recommend that others do the same. Besides I am not a known name — yet I hope — in the literary world. After the proof arrived early last week, I read it four times. In the process I found problems that needed to be fixed — missing words, inconsistent word usage, and a couple of other things — that I somehow missed in the umpteenth times I read the book before. It was a relief, however, that I enjoyed the book each time I read it. I even laughed at parts. This project has been a learning experience s for the both of us — she about design, me about process and promotion. Today I got the A-OK the updated version met CreateSpace’s specs. Michelle and I are going out to lunch to celebrate next week after the copies I ordered arrive. And, yes, we will be talking about more projects for the very near future. ABOUT THE PHOTO ABOVE: That’s the proof copy plunked on top of books from my library.